A selection of films in the And Europe will be Stunned series are to be shown at the Polonia Pavilion between June 4 and November 27. The series spans Wild Seeds (2005), Summer Camp/Awodah (2007), A Declaration (2006), Mary Koszmary (Nightmares) (2007) and Mur I Wieża (Wall and Tower) (2009). The Israeli artist has been working on her project in Poland over the past few years, engaging in mutual dialogue with Polish cultural institutions and individuals active in the realm of Israeli relations with the Western world. The series was most recently shown at the Moderna Museet Malmö, running between May 22 - September 19, 2010. Mary Koszmary is the first film in the trilogy and explores a complicated set of social and political relationships among Jews, Poles and other Europeans in an age of globalisation. A young activist delivers a speech in the abandoned National Stadium in Warsaw. He urges three million Jews to come back to Poland. The second film in the trilogy, Mur i wieża was made in the Warsaw district of Muranów, where a new kibbutz was erected in the architectural style of those constructed in Israel in the 1930s. The trilogy concludes with Bartana's latest work Zamach (Assassination). The film, which will have a parallel premiere at the Zachęta National Gallery of Art in Warsaw, explores the idea of a multinational community and new Polish society. The film takes place in the not too distant future, during the funeral ceremony of the leader of the Jewish Renaissance Movement, who has been killed by an unidentified assassin. It is by means of this symbolic death that the myth of the new political movement is unified—a movement that could become a concrete project to be implemented in Poland, Europe, and the Middle East in the days to come. Bartana explains that in her project: "I quote the past, the time of Socialist utopia, youthfulness and optimism — when there was a project of constructing a modernist idea of a new world." Apart from the polemics of the Polish-Jewish relationship, this is a story about the complexities of cultural integration. 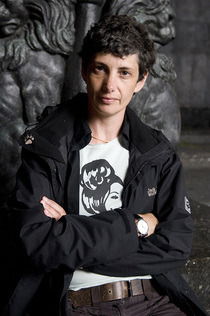 The history of the Israeli state and the Israeli-Palestinian conflict permeates Yael Bartana's work, which also explores complex relations between Jews, Poles and other Europeans in the age of globalisation. Aesthetically referencing propaganda films of the 1930s, Yael Bartana weaves together contrary movements that in different ways contributed to the founding of Israel: European anti-Semitism, colonialism, Socialism, and Zionism. The origin and development of Zionism are scrutinized in light of Israel's political stance toward the Palestinians and at a certain point we are geographically transported from Israel/Palestine to Poland, where a fictive political movement - "The Jewish Renaissance Movement in Poland" - advocating a return of 3 000 000 Jews, emerges amid historical layers and reflections. the films exist in a troubled borderland between documentary, propaganda and fiction. Yael Bartana was born in 1970 in Moshav Kfar Yehezkel, Israel. Today she lives in Amsterdam and Tel Aviv. She is a graduate of the Bezalel Academy of Arts and Design in Jerusalem and the School of Visual Arts in New York. Over the past decade she has earned considerable international attention and acclaim. In 2010 she was awarded the prestigious Artes Mundi Prize - one of the UK's major art prizes. Yael Bartana has had several solo exhibitions at among others Museum of Modern Art in Warsaw, Van Abbemuseum in Eindhoven, MOMA's PS1 Contemporary Art Center in New York and Kunstverein Hamburg. In year 2003 she held a six months long artist-in-residency at the Rooseum Center for Contemporary Art in Malmö, Sweden. The publication A Cookbook for Political Imagination accompanies the exhibition. It forms a manual of political instructions and recipes, provided by more than 50 international authors. Covering a broad spectrum of themes, the cookbook comprises manifestos, artistic contributions, fictional stories, food recipes, social advice and guidance for members of the movement. It is the first book published under the auspices of the Jewish Renaissance Movement in Poland, and has been edited by the curators of the exhibition, Sebastian Cichocki (chief curator at the Museum of Modern Art in Warsaw) and Galit Eilat (writer, curator, founding director of The Israeli Center for Digital Art in Holon and co-editor in chief of "Maarav"). It is designed by Guy Saggee from Shual Studio (Tel Aviv) and published by Zachęta National Galery of Art and Sternberg Press. Jury members: Bożena Czubak, Bartłomiej Gutowski, Donata Jaworska, Joanna Kiliszek, Katarzyna Kozyra, Anda Rottenberg, Karol Sienkiewicz, Stach Szabłowski, Monika Szewczyk, Adam Szymczyk, Agnieszka Tarasiuk i Hanna Wróblewska. Pavilion Commissioner Hanna Wróblewska; curators of the exhibition Sebastian Cichocki, Galit Eilat; commissioner assistant Joanna Waśko. "Zamach" was commissioned by Artangel, Outset Contemporary Art Fund, Louisiana Museum of Modern Art, The Netherlands Foundation for Visual Arts, Design and Architecture and Zachęta National Gallery of Art in association with Annet Gelink Gallery, Sommer Contemporary Art, Ikon Gallery, Netherlands Film Fund, Australian Centre for Contemporary Art and Artis and produced by My-i Productions in association with Artangel. The Art Biennale in Venice takes place between June 4 - November 27, 2011, directed by Bice Curiger. For more information, see:www.labiennale.org.